We are excited to host our first Woon Shabu Shabu dinner on Saturday, April 21st at 7pm in Silverlake (Just added: Sunday, April 22nd at 7pm). You've seen it on the Woon Instagram, and now we can't wait to share the experience with everyone. Seating is very limited and by reservation only. To reserve, please fill out the form below, and if seats are still available we will send you additional details. Please note, Shabu Shabu is a community and family style dinner. All ingredients are passed around on shared plates and there is a chance you may be sharing a pot with a stranger. This is the beauty of it and makes for the best conversation. Includes a selection of meat, fish, vegetables and all the Shabu essentials. All you can eat until we run out. Thank you! We'll be getting back to you shortly. We're popping up for a second time at our favorite Highland Park cocktail bar, ETA, on Thursday, April 12th from 6pm until we sell out. Come munch our Beef Noodles, Veggie Noodles and Pork Belly Baos. ETA will be curating a selection of drink specials to pair with our menu featuring Our/Los Angeles vodka. 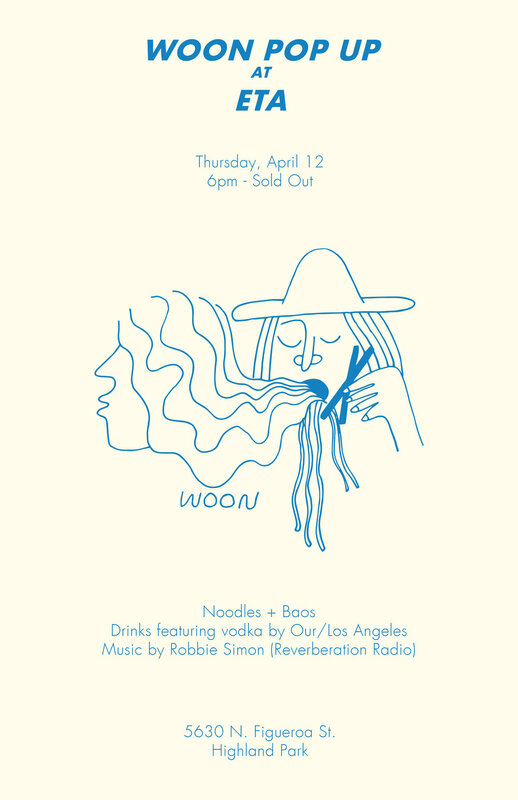 Our friend and favorite DJ Robbie Simon from Reverberation Radio will be playing some records throughout the night. Come early and come hungry! Noodle doodle by Ty Williams. 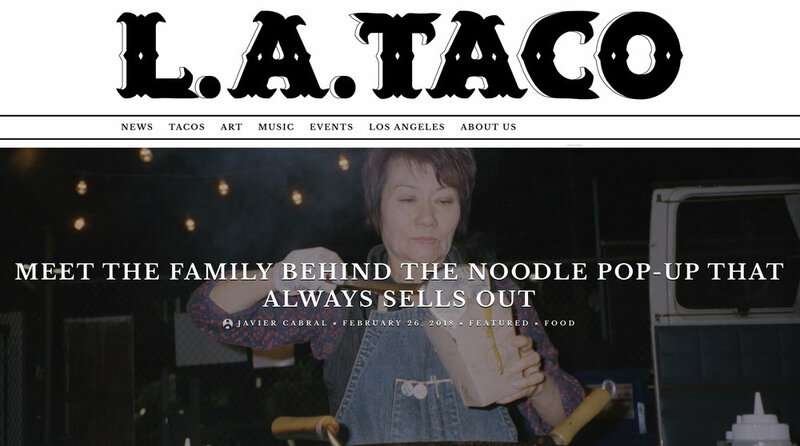 Noodle Love • LA Taco "Meet the Family Behind the Noodle Pop-Up That Always Sells Out"
Is there a better food to accompany a night of drinking than expertly charred noodles? This scenario is common for the Fong family, no matter how many covers they prep for. We're popping up at our favorite bar/beer garden and music venue, Resident in Downtown LA Arts District on Friday, March 2nd from 7pm - Midnight. Come munch our Beef Noodles, Veggie Noodles and Pork Belly Baos. Resident will be curating a selection of drink specials to pair with our menu. Sonny Smith of one of our favorite bands, Sonny & The Sunsets, will be performing live inside. Tickets to Sonny Smith are $12 and can be purchased here. However, tickets are not required to come eat and hang with us at the outdoor bar and beer garden. We've partnered up with Highland Park's favorite neighborhood cocktail bar, ETA, for a one-night pop up. We'll be taking over their kitchen for the evening to serve our Beef Noodles, Veggie Noodles and Pork Belly Bao. ETA will be curating a selection of drink specials featuring Tsingtao and The Real McCoy Rum - presented by brand ambassador Nathan Hazard (Coconut Club / Drink Special). DannyG and Los Angeles non-profit radio, Dublab’s Jasmin Blasco, will both be spinning an eclectic mix of vinyl throughout the entire evening. We'll be serving Beef Noodles and Veggie Noodles for the opening reception of Adam Tylicki's solo exhibition, Dark Daze at Baert Gallery in Arts District. Beef Noodles, Veggie Noodles, and drink specials by El Prado! Find us on the back patio.